As wealth level increases, so does usage of a financial advisor. How do the Ultra High Net Worth investors find their advisors and what criteria do they use to select them? According to Spectrem Group’s new 2016 report, Financial Behaviors and the Investor’s Mindset, the wealthier an investor is, the more likely that investor is to use a financial advisor to some extent, whether it be for a specific life event or for all their investment decisions. Eighty-two percent of Ultra High Net Worth investors with a net worth between $5 million and $25 million use an advisor, while 77 percent of Millionaire investors with a net worth between $1 million and $5 million do so and only 67 percent of non-Millionaire investors do so. With that high percentage of usage among UHNW investors, it is revealing to determine how they go about finding the advisor they work with. Just over half of UHNW investors found their financial advisor through a referral from a family member or friend, while 12 percent said they were introduced to their advisor via a cold call. No more than 5 percent found an advisor through a general advertisement, seminars or special events or a social media posting. Millennials and Gen Xers comprise the largest percentage of UHNW investors (68 percent) by age to receive a referral from a friend or family member, while the oldest UHNW households were most likely to have found their advisor through a cold call. By occupation, business owners were the most likely to have been guided to their financial advisor through a referral, while senior corporate executives are most likely to have found their advisor through a cold call. In the case of the younger UHNW investors, these referrals are most likely to come from a parent, while for older investors it will come from a business associate or personal friend. What do UHNW investors consider to be most important in choosing a financial advisor? First and foremost is that the advisor is perceived to be honest and trustworthy, according to 30 percent of these investors, followed by an advisor who comes with that strong referral. Rounding out the top five most important criteria in choosing a financial advisor are the advisor’s track record, fees and commissions charged and whether the advisor is associated with a well-known brand or company. Across the generations, UHNW Millennials aren’t as focused on an advisor’s honest and trustworthiness as they are a strong referral, the company with which they are associated, and the fees and commissions charged. They are also more focused than older investors on being provided with non-traditional opportunities and wealth management capabilities to meet their needs. UHNW professionals (such as doctors and lawyers) put the highest stock in a prospective advisor’s honesty and trustworthiness, as well as the advisor’s track record, while senior corporate executives are more likely than other UHNW investors by occupation to choose an advisor based on a strong referral. 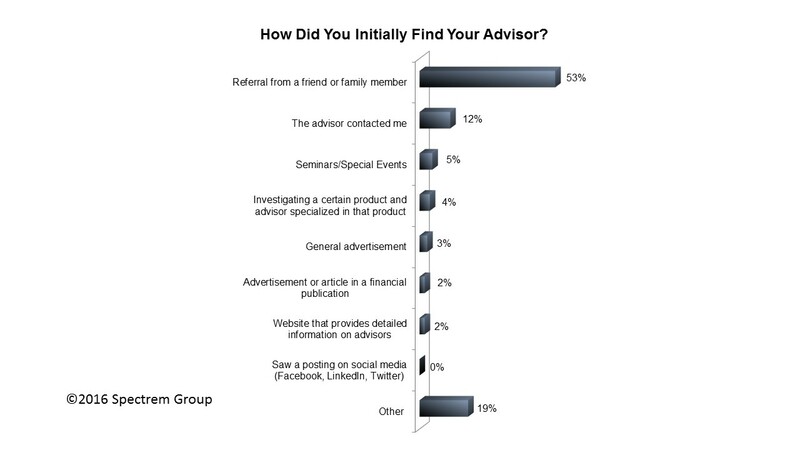 Advisors must understand that a majority of high net worth investors choose an advisor they meet through referrals. Investors refer their advisors when they perform to their satisfaction, communicate well, listen to the investor’s desires and concerns, and develop trust. Advisors can certainly suggest to their investor clients that they refer their services to others. There is no harm in asking.